NEW YORK — Suicide rates among middle-aged Americans have risen sharply in the past decade, prompting concern that a generation of baby boomers who have faced years of economic worry and easy access to prescription painkillers could be particularly vulnerable to self-inflicted harm. More people die of suicide than in car accidents, according to the Centers for Disease Control and Prevention, which published the findings in the May 3 issue of its Morbidity and Mortality Weekly Report. In 2010 there were 33,687 deaths from motor vehicle crashes and 38,364 suicides. Suicide has been viewed as a problem of teenagers and the elderly, and the surge in suicide rates among middle-aged Americans is surprising. The most pronounced increases were seen among men in their 50s, a group in which suicide rates jumped by nearly 50 percent, to about 30 per 100,000. For women, the largest increase was seen in those ages 60 to 64. While suicide rates can be notoriously difficult to interpret, CDC and academic researchers were confident the data documented an increase in suicide deaths and not a statistical anomaly. While reporting of suicides is not always consistent, the current numbers are, if anything, too low. The reasons for suicide are often complex, and officials and researchers acknowledge that no one can explain with certainty what is behind the rise. CDC officials cited explanations including that, as adolescents, people in this generation had also posted higher rates of suicide. 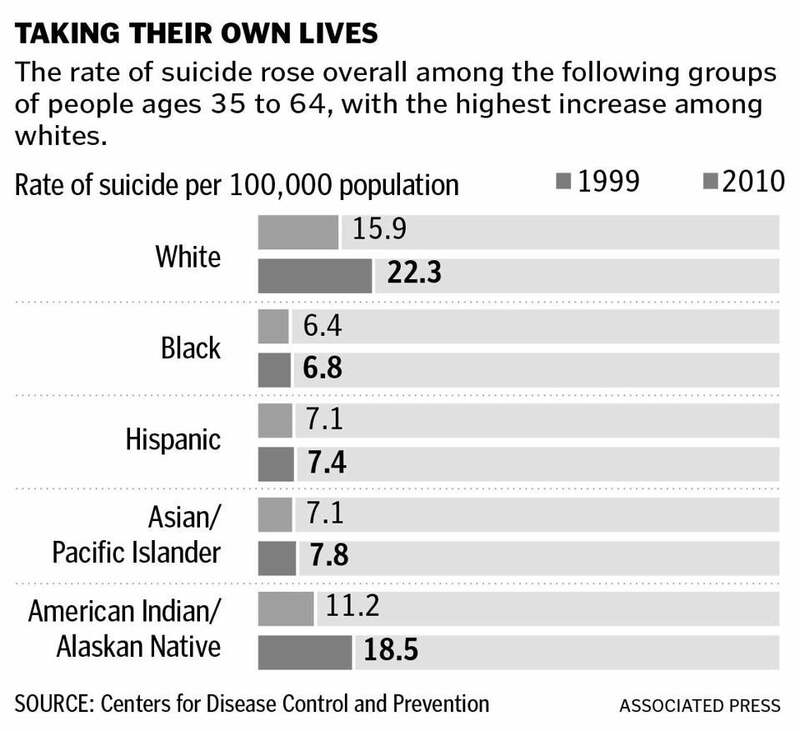 The rise in suicides might also stem from the economic downturn. Suicide rates rise during times of financial stress and economic setbacks. “The increase does coincide with a decrease in financial standing for a lot of families,’’ Arias said. Another factor may be the availability of opioids like OxyContin and oxycodone, which can be deadly in large doses. Although most suicides are carried out using a firearm, there was a marked increase in poisoning deaths and hangings. Poisoning deaths were up 24 percent overall during the 10-year period, and hangings were up 81 percent. Arias noted that the higher suicide rates might be due to life and financial circumstances unique to the baby boomer generation. Men and women in that age group often cope with the stress of caring for ­aging parents while still providing financial and emotional support to adult children. Preliminary research at Rutgers suggests the risk for suicide is unlikely to abate for future generations. Changes in marriage, social isolation, and family roles mean many of the pressures faced by baby boomers will continue, Phillips said. Nancy Berliner, a Boston historian, lost her 58-year-old husband to suicide nearly two years ago. While the reasons for his suicide were complex, she would like to see more attention paid to prevention and support for family members who lose someone to suicide.